A motley crew of six thieves, lead by their most cunning and terrifying leader, embark on an impossible (IMPROBABLE) heist—to rescue a prisoner with dangerous information, from an unbreachable prison. 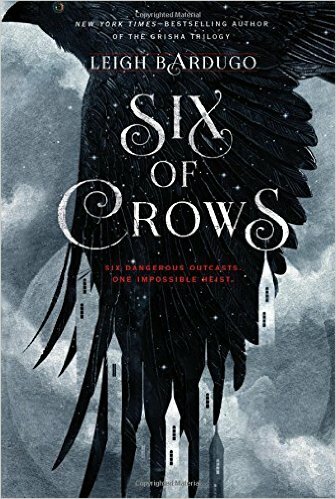 Six of Crows brings us back to Bardugo's Grisha world, set a few years after the final events of Ruin and Rising. You do not have to read the Grisha Trilogy (Shadow and Bone, Siege and Storm, Ruin and Rising) before Six of Crows. If you have, there are little tiny mentions here and there that will have deeper meaning to you, even though their significance isn’t important for this story. Even though Six of Crows is set in the same world, it feels much different. I was impressed that Bardugo could create such a fresh, new type of story using the same foundation. Some series that do this often just feel like the same thing with new characters, but I didn’t feel that way with Six of Crows. The story is told from different points of view in alternating chapters. The only thing I was disappointed in/found weird was that we only got into the heads of five of the six characters. I’m not quite sure why Wylan didn’t voice any chapters, but hope that he does in the following books. I found this suspenseful and clever, with humor in all the right places. But what really makes this story is not even the heist itself. Bardugo creates a set of excellent, well-developed characters and its their reactions and actions to the events that make this such a great read. Gang leader, Kaz Brekker, is one of the most awesome characters I have read in awhile. I can’t decide if I should be in love with or frightened of him. Probably both. The Darkling (Grisha Trilogy) and Kaz both have this similar edge that makes them irresistible and terrifying at the same time. This is definitely one of my top favorite reads this year and I highly recommend it.